Club Ice Hockey took on MCHC rival Fordham University on Saturday, December 1st at the Northwell Health Ice Center at Eisenhower Park. Despite holding the lead for most of the game, Hofstra was unable to finish on top and dropped the game 6-5 in a shootout. Goals were scored by Zack Lamberti, Darren Schwartz, Matt McGuirk, and Andrew Gagnon, who netted two in the effort. On Sunday, December 2nd, Hofstra celebrated their Senior Night against Stockton University back at the Northwell Health Ice Center. Despite dropping the contest by a score of 4-1, the team was able to honor their seniors by giving them one last shift together during the 3rd period. Antonio Binotto was the lone goal scorer for the Pride. 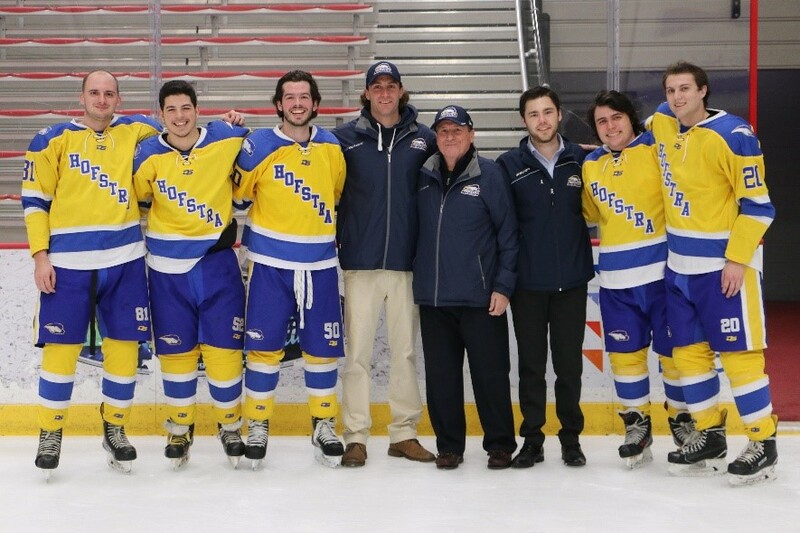 Hofstra Club Ice Hockey seniors and coaches gather on the ice for the final time on Sunday, December 2nd. members attended the event, which was very successful. Club eSports hosted their Game On! Tournament on Saturday, December 1st in the Student Center Multipurpose Room. The club participated in games of Pokémon Showdown, Super Smash Brothers, Mii Swordfighter, Dragon Ball FighterZ and WindJammers. Binotto was all over the ice for Hofstra in their game against Stockton University, netting the team’s only goal in a 4-1 defeat. This will be the last Club Sports Roundup for the semester. Thank you to all of you have read these posts and supported our tremendous club sport athletes. We can’t wait to get back to sharing all their accomplishments starting in February. Happy Holidays!